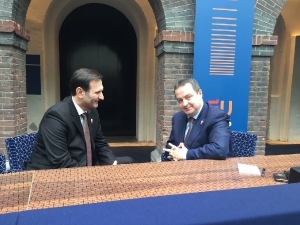 First Deputy Prime Minister and Minister of Foreign Affairs of the Republic of Serbia Ivica Dacic participated at the Informal Meeting of EU Foreign Ministers (GYMNICH), held in Amsterdam, on February 6-7, 2016. 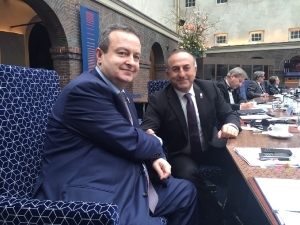 First Deputy Prime Minister and Minister of Foreign Affairs Ivica Dacic stated that the Republic of Serbia is ready to take part and to make a contribution to the future plan of the European Union to reduce the migratory pressure. Minister Dacic also asked for a support of all members of the European Union in regard to acceleration of the negotiating process of the Republic of Serbia with the EU during 2016. 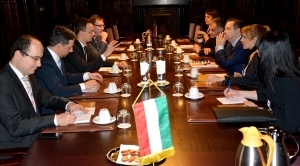 On the margins of the meeting, Minister Dacic met with the Ministers of Foreign Affiars of Hungary, Croatia and Turkey.